Fisher Hill on Rte. 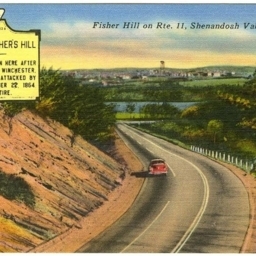 11, Shenandoah Valley, Va.
Color postcard with a picture of US Route 11 at Fishers Hill and the interpretative highway sign describing the Civil War Battle that occurred there. The image is looking south from the top of the hill toward Strasburg.